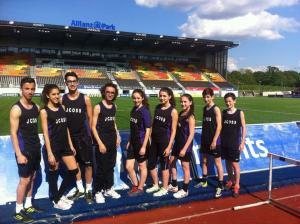 JCoSS WIN Barnet Schools Year 8 Football Tournament. whole tournament of 16 games the defensive nature and battling qualities of the JCoSS shone through. Sam Baker, Jonathan Brown, Harry Brodin, Jack Earle, Benjy Radnor, David Noyvert and Eddie Lisberg. Year 9 Football Team are DOUBLE WINNERS!! If one could report on a football match through images alone in this case it would depict champagne bottles smiley faces and thumbs up aplenty. JCoSS Year 9 Boys football team played with all the chutzpah and swagger of champions elect even before they were crowned winners of the Barnet Schools Power League tournament. With both JCoSS A and B teams both finishing 1st in their respective competitions it proved to be a successful tournament and resulted in a clean sweep of medals, trophies, pride and swag for the lads. Well done to all the students. a fantastic achievement! !